Learn what Robert's book 'Exclusive Pedigree' is all about here! Thank you for taking the time to come back to sit with us and update us on your life and your writing! Tell us something about yourself. (Where are you from, what do you do to pay the bills, significant relationships, as little or as much as you want). Hi, I was born in Leicester, UK, sixty years ago. For the last thirty years I’ve lived in Eastbourne, a lovely town on the south coast of England, with my wife and various cats over the years (we currently have three). I work as a software consultant these days but was an accountant prior to that. The past 10 years I’ve been self-employed and that has given me much more freedom to pick and choose the work I do. It all started with a diary I kept whilst travelling around Asia back in 1981. This formed the basis of a project that I have been working on for over five years now. This involved typing up the 600 pages into a manuscript and the subsequent edits that led to releases of Time in Thailand (Part 2), £99 to Hong Kong (Part1) and then the entire Fred’s Diary 1981. The second edition has been released this month. Travel memoirs. I love reading about other people’s adventures. There are so many great stories out there and it is always a pleasure to read of other people’s travels and experiences. Publication of the diary has become more than a hobby and could even be called a passion I suppose. It has led me along different paths than I would never have anticipated. For instance, in parallel with the daily serialisation of the diary I ran a travel story competition on my blog. This became more of a success than I could have hoped for, with thirty fantastic entries from twenty different authors and writers. Money does come in handy! I am a keen amateur photographer and love going out and capturing snaps of life. This combines well with my love of walking and exploring places. Has writing your memoirs had an effect on you and how you now live your life? If so, in what way? Editing the diary has bought back so many memories. It is different from a memoir where one tries to recall everything. I had written down almost every single thing that happened to me during those few months. Those memories have shown me how similar in a lot of ways I still am to that young man of twenty-five, in my head anyway! A fascinating insight into a young man’s travels around Asia in the early 1980’s. I have two books planned at the moment. Firstly, I will publish the thirty travel stories that were entered into the blog competition earlier this year. Secondly, I am going to work on releasing my father’s biography. I worked on it before and after his death over twenty years ago. It was published at the time to members of the family. Only recently did I discover from my mother that it was always his dream to have it published properly. Maybe I can now achieve that dream! A few years ago I read in a PC Plus magazine about Kindle and how you could create your own book on Amazon. This led directly to my first self-publishing efforts. The freedom of being able to make your own decisions and control your own destiny (even if you do make mistakes along the way). Marketing experience and advice. Also, the power of the publishing houses to get books in front of a wider audience. With the second edition I have invested in a professional final edit and a stunning new cover. Yes, I believe the resources are there to produce high-quality and professional self-published books. Thanks again Robert! We Enjoyed Our Time Together With You! For those readers who are not familiar with you or your work can you tell us a little about yourself? Born in Leicester, UK in 1955. My family moved south to a village in Surrey called South Nutfield when I was 11 years old. We moved into Dawn Cottage and this was where I spent my formative teenage years. Attended Reigate Grammar School, which was a five mile journey (mostly by train and bus). It was here that I picked up the nickname of Fred. Returned to the UK for the winter and worked 12 hour night shifts at a plastics factory to get some more money together for the following summer. In the spring of 1977 I set off again, this time to hitch-hike around Europe. For 4 months I made my way through Belgium, Luxembourg, Germany, Austria, Yugoslavia, Greece and several islands, Italy, France, Spain and back to Ibiza again for the last couple of months of the summer. It was during this return visit that Fred met Rita and this time when I left the Balearic Islands it was to head for Frankfurt in Germany. I moved in with Rita, who lived with her parents in a house in Ruppertshain, a small village in the Taunus hills. Initially I got some work on a building site and then in a Coca Cola factory. By the spring of 1979 there was enough money in the coffers to fund a trip to the States and Canada. I started in New York where I spent a week or so before travelling on a 3 month Greyhound bus pass up the east coast, across Canada, and down the west coast where I stayed in LA for a couple of weeks. Then headed back across the States to Florida and back up the east coast to end my journeys in New York, An incredible round trip. The first part of my diary was released in 2009 and its title, ‘Time in Thailand’, probably indicates to you that things didn’t go as planned. ‘£99 to Hong Kong’ was published in 2011 and covers the first part of my trip where I did some work as an extra for Chinese television. The full diary, ‘Fred’s Diary 1981’, was made available on Kindle and paperback in December 2013. Returning to Frankfurt in the late summer of 1981 was a shock to the system, a real case of reverse culture shock. Things soon get back to some normality though as I went back to the bank and worked there for another 5 years, becoming group leader of the accounts department. By the time I left my German was fluent.During this period I lived in Sachsenhausen, the bar and restaurant area of Frankfurt near the Main, often staying out late and enjoying life. Holiday allowance was generous in Germany and I was able to take 4-5 weeks travelling time off each year. I enjoyed trips to the Canary Islands, Scandanavia and Turkey. After returning from Turkey in November 1985 my life changed as I got together with the love of my life and in July 1986 I moved back to Eastbourne in the UK to be with her. We are still together nearly 30 years later and have lived in the same house since 1988 (the mortgage is almost paid off!). We got married in Kenya in 1994 and are cat lovers, having had a succession of rescues. The travel bug has never completely gone away. We’ve had great holidays in Portugal, Crete, Germany of course, Australia and the Seychelles. I had to start from scratch with my career in the UK, but found my niche in accountancy and computer software. I have had the opportunity in the last few years to travel with work and have been all over Europe as well as Singapore, Australia (for a week! ), Ghana (at a Guinness brewery) and Suriname (in the middle of the rain forest). If you could share one thing about yourself that currently your readers don’t know what would it be? I was born into a religious sect called the Exclusive Brethren (also known as the Plymouth Brethren). They allow no social contact with people outside of the cult and at that time we were not allowed to read newspapers, listen to the radio or watch television. My father took us out when I was around 9 years old and we were excluded from seeing relations who stayed within the cult. I never saw my grandparents again. Mostly life stories, travel memoirs or travel novels. Am currently reading ‘Naked Determination’ by Gisela Hausmann. We got in touch through WLM and she read ‘£99 to Hong Kong’ and wrote a very favourable review. I was really interested in her experiences and am thoroughly enjoying her book. When you're not reading or writing, how do you spend your time? These days I work for myself, mostly in London on short-term or interim contracts. At present I am working at the Royal British Legion HQ near London Bridge. This is only just across the river from where I started work in 1974, 40 years ago. It’s a small world isn’t it! Do you remember the first book that had an impact on you, your life or your writing? Not strictly a book but, ‘The Wasteland’ by TS Eliot. Now let's talk about your books and your writing. How long have you been a writer/author? I have always had an interest in books and literature but would not consider myself to be an author, more of a diarist or a travel memoir writer. I have dabbled with short stories over the years but had never published anything before ‘Fred’s Diary 1981’. No, not really. I did try a correspondence course when I was living in Germany but the lifestyle and studying didn’t really mix I’m afraid. This may sound strange but probably Jack Visick, who was the landlord at my local pub for a couple of years. He is a young, motivated guy and encouraged me to publish ‘Time in Thailand’ and also did the cover design for me. One thing led to another and I went on to write up and edit the rest of my diary after this. In recent weeks, definitely Frank Kusy – I have read and thoroughly enjoyed all three of his travel books: Kevin and I in India, Off the Beaten Track and Rupee Millionaires. He also introduced me to WLM and has been inspirational in encouraging me to promote my book. As Fred’s Diary is 165K words, it took me a long time to write up and edit in my spare time. I would usually do this in the evenings while my wife was watching the soaps on TV. In the past it was always when I was travelling and I would capture my memories wherever and whenever I could. Now I have a comfortable office that I use to work from home but I am not sure how conducive that would be to writing. When I have more time I would like to embark on writing a travel novel but this is just a dream at the moment. 2/. 4* review from Frank Kusy, author of Kevin and I in India, Off the Beaten Track and Rupee Millionaires. Doug spent several months reading the diary on a day-by-day basis and would constantly let me know how far he’d got. Frank managed to read it in two sessions. Extremely important. I can remember the disappointment when I got several bad reviews for ‘Time in Thailand’ but have been encouraged by the number of good reviews I have got so far with ‘Fred’s Diary 1981’. Yes, by highlighting both the positive and negative aspects of my writing. How do you engage with your readers and fans? Mostly through social media, my FB page, WLM and Twitter. ﻿Do you have a current work in progress, and if so can you tell us a little about it and when it is likely to be released? Not at the moment although I am seriously considering editing ‘Fred’s Diary 1981’ further and releasing it again as a book about half the size, say 80K words. What are your thoughts on the use of social media for indie author marketing? I have found it really useful for networking and have made contact with a number of fellow authors and potential readers. It has taken quite a lot of time but over the past year I have built up my Facebook page to 1.3K likes and have over 10K followers on Twitter. 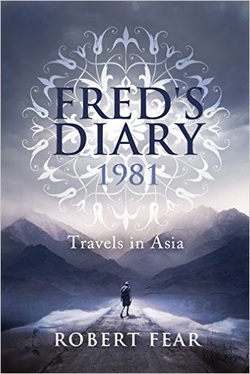 Backpacking Thailand, India, and Nepal at the dawn of the 1980s, Fred's Diary is not only a time-capsule but a cautionary tale of gems, drugs, and jail time as he explores waterfalls, Buddhist temples, and snow-capped peaks. I found this story to be informative, as well as entertaining, and it made me want to hit the road again. . . Well done! I came to this diary with some expectation, having written a very similar diary myself…and only a few years after this one. And I was not disappointed. ‘Fred's 1981 Diary’ is a fascinating time capsule from the heyday of backpacking round Asia, when Dylan and Marley blasted from tinny tape machines, everybody headed north to the trekky north of Thailand or the funky houseboats of Kashmir, and dope was cheap and plentiful. Though in Fred’s case, the dope gets him into an awful lot of trouble, and after a slow-burn of a start in Hong Kong, where he finds work as a TV extra, we are suddenly plunged into a ‘Midnight Express’ scenario where he is flung into a hellhole of a Thai jail for possession. This section is riveting, and is the stuff of which films should be made. His ‘lucky’ escape – or rather deportation – leads him on to Nepal, where he somehow negotiates a gruelling week of trekking on a whole cornucopia of drugs (respect! ), then on to India, where he survives a number of near-death bus journeys, witnesses (and beautifully describes) a Kashmiri wedding ceremony, and battles with his feelings for girlfriend Rita, who has joined him from Germany. This latter part of the book I particularly enjoyed – far less straight reporting, far more reflection on the nature of relationships, and indeed of the nature of life itself. Okay, an awful lot of illicit substances have gone down by this point, but Fred – as honest and revealing as ever – tells it how it is: “I feel I’ve learned a lot, using hash and grass to set me thinking, not just to get blasted.” And it is this honesty, coupled with a very engaging and readable writing style, that ensures that this diary reads as fresh today as when it was first written. Highly recommended. p.s. I’ll be upping my rating to 5 stars just as soon as the author has attended to a few editorial issues of which he is aware.